Hi everyone. Happy Monday! I hope you had a good weekend. 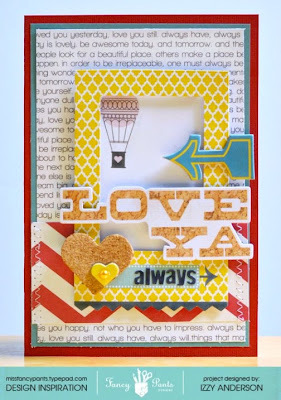 I played a bit with What A Wonderful Day, a super cute mid-release from Fancy Pants Designs. I'll have more to show later this week, but wanted to peek in here today with this quick card. The hot air balloon was part of a piece of patterned paper that I cut down to size. I pop-dotted the yellow frame on top and added a sentiment. I'm really digging the cork trend. Fancy Pants has a new variety of cork hearts, stars, arrows and labels. They are great for adding dimension without much weight. Love them. I'll be back this week with some more projects from this line. Thanks for stopping by! oh what a fab card! love it!! Looks fantastic - I love the dimension you achieved with the frame and embellishments. Wowwwwwwww! This is gorgeous! LOVING the colors and love love love the cork and the balloon!!! Adorable card Izzy!! Love the mix of patterns and the layering over the frame! Pure adorable!!! Love the colors and all the fab elements! This is one fabulous card, Izzy! 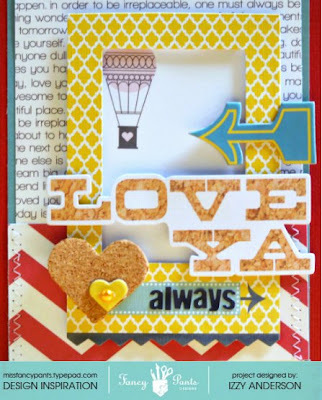 I love the mix of elements and the depth you created by framing the hot air balloon paper. Beautiful and airy card, Izzy! I love it!